Finesse Systems This closet system draws inspiration from Italian home design with it's floating shelves, drawers, and hanging rods. Finesse closet system is a Closet Factory exclusive drawing its inspiration from modern Italian home designs. Unlike Closet Factory’s floor-based systems Finesse is suspended off the wall with specialty brackets causing the rods, shelves, drawers, and cabinets to appear as though float in mid-air. 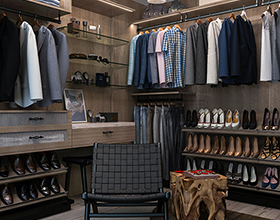 The finished design of a Finesse closet emphasizes the display of the wardrobe rather than optimizing for more storage space for clothing, shoes, and accessories. This system frequently appeals to people who curate their clothing keeping an organizational method in place to purge as they add new pieces. Maintaining an uncluttered space similar to that of a quaint boutique is one of the many charms of Finesse. The European flair the system brings visually to closet organization is another exciting feature for fashion-conscious. The floated rods, and shelving creates display zones that showcase curated collections displaying shoes, handbags, and other essential items in an artistic and yet minimalistic fashion. Through the use of clean, invisible brackets, the Finesse system highlights sleekness, neatness, and elegance. Another way this Italian-inspired system achieves worldly sophistication is through the use of multiple shelving depths. 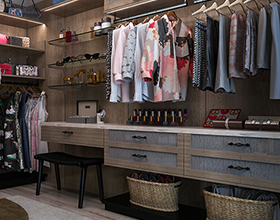 Unlike traditional wall hung closet systems that use only one depth for drawers and shelving, Finesse incorporates various depth options, that creates more display variation for the display and storage of multiple wardrobe items. This system lends itself to two-toned units and textured materials. Elegant upgrades include LED rods and under-shelf lighting strips, and slanted shoe shelves that float while the standard hardware is anything but standard with U-shaped rods, a sleek platform base, and matching or contrasting backing. All add another layer of understated glamour. The timeless modernist feel makes Finesse a great system to use outside the closet as a wardrobe wall unit to blend perfectly with adjoining areas of the bedroom such as bathrooms and hallways. Finesse is all about style and less about increasing storage, for this reason, one should evaluate if this is the right system for storing existing clothing and future purchasing habits. 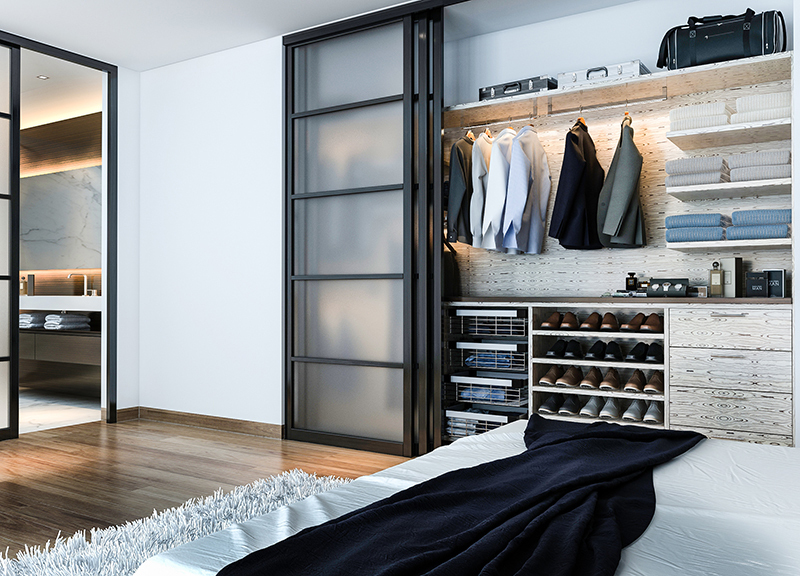 It’s designed to be a showpiece and make a statement with units constructed to be 7 or 8 feet tall creating more space than the typical closet that comes with a built-in rod and shelf, but it’s not as expandable as Closet Factory’s floor-based systems. It is highly recommended working with a closet designer to confirm the wardrobe inventory fits into the closet and the design. Finesse is a visual system that looks its best laid out as a boutique. Clothing should hang loosely on the rods rather than tightly packed while folded items may contain two or three pieces to the stack leaving plenty of air space above. Shoes are stored in the lower portion of the sections or below drawers. Components such as the rods, shelves, and drawers anchor into the system’s back panels, therefore, walk-in closets should have a square or rectangle shape. Curves and octagon configurations may not be suitable for this system. Additionally, it’s essential to have a ceiling height of at least 8 feet. 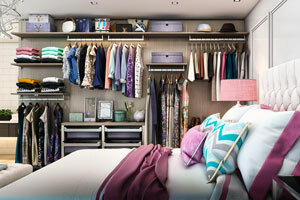 The taller the ceiling, the more the airy quality of the closet will be enhanced. Since style is the main component of the system, a great light fixture is a must-have in a walk-in closet. Jumping onboard with the chandelier trend is a great way to enhance the space. Flooring is another critical part of the room design along with area rugs, decorative boxes, matching hangers, and other decorative items. Planning for a complementary designed chaise lounge, love seat, or chair will accentuate the room as well as add additional function while dressing. See why it's a favorite! This walk-in closet showcases Finesse at it's best with an area rug on wood floors, modern light fixture, counters, and wicker baskets. close-up of floating glass shelves for display. Rods and shelves are arranged to group wardrobe items so like are with like. Extensive floated counters with marble faux tops with decorative baskets. Visit the custom closets gallery and see more pictures.